Check out this groovy game based off your favorite cartoons from the 1970s. Players control intrepid members of an Extreme News Team on the hunt for UFOs, ghosts, mothmen, and other cryptids. But not all is as it seems—for every authentic cryptid uncovered, there's another half-dozen frauds: executors disguised as bigfoot trying to bilk the rightful heirs out of an inheritance; restauranteurs in mummy bandages trying to stamp out competition; or a ruthless robber-baron masked as a vampire trying to buy land cheap. 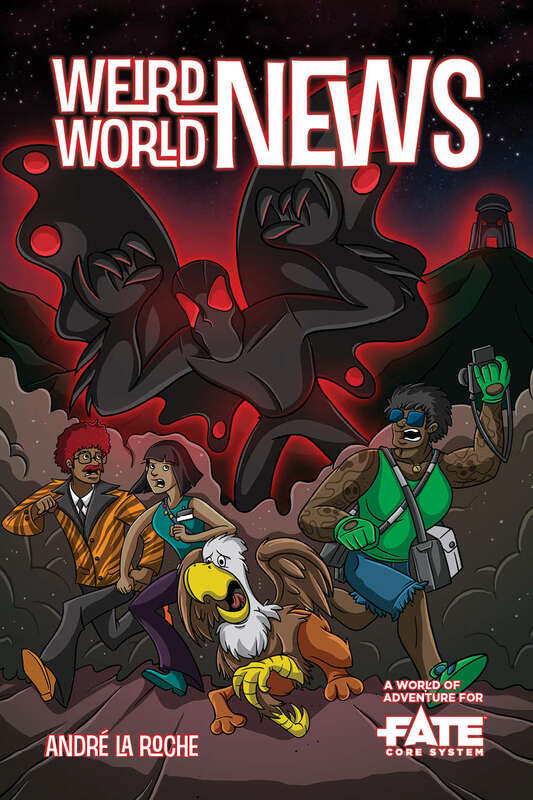 Unveil the frauds and stop the monsters in Weird World News, the latest Fate World of Adventure from André la Roche. Hop into the Weird World News van, Griffy! Let’s hunt some monsters!